Sadly, DBTA is becoming known for taking interesting companies, putting them in a blender and having each lose their message. A recent webinar included Cask, Attunity and HPE Security – all in a one hour time slot – again shows the problem. It was a mess. Cask is a young Hadoop company with an interesting opportunity (Disclosure: As I’m discussing marketing, I need to mention I recently interviewed for a position at Cask). The company is working to put wrappers around Hadoop code to make it easier for IT to use the data platform. One of their products is Cask Hydrator, to help populate the database. That begins to move the message of Hadoop out of the early adopter phase and into a business message, but the presentation was still far to technical. Attunity then presented and a key point was that they make data ingest easy. If that sounds like a similar message to Cask’s, you’re right. Why the two were together on the webinar when much of what they said sounded like competition wasn’t clear. On the good side, Attunity did a far better job at presenting a business message, both in how the presenter talked about the products and in which case studies were used. HPE Security made another appearance, tacked onto the end of a presentation. Data security is critical, and HP has put together a very good message on it, but it didn’t vaguely fit the tone and arena of the previous presenters. The smaller companies seem to have a problem. It’s simple: Their involvement in webinars might be driven by marketing, but it’s being controlled by bean counters. Each of the three companies had something good to say, and each should have taken the time to say it in a stand-alone webinar. However, sharing costs was made to be the primary issue and so the mess ensued. When should firms share the spotlight? That should happen when the item missing from the top of my presentation is there. The missing piece is having a joint story to tell. None of the case studies mentioned the companies working in partnership. None. When multiple vendors work to provide a complete solution to a client, even if the vendors might sometime compete, there’s a strong case for multiple companies in a webinar. This webinar was not that. It was companies not feeling strongly enough about themselves for the other executives to overrule the COO’s or CFO’s and push a solid webinar about themselves. All of these companies are worth looking at within the big data arena, just not in such a forced together setting. Stand on your own or show a joint project. This entry was posted in big data, Enterprise Software, Marketing and tagged attunity, cask, dbta, hpe security, marketing, teich communications on August 18, 2016 by David Teich. People at technology startups love to call the industry giants dinosaurs. The analogy fails for a number of reasons. The funniest is that the dinosaurs existed for many millions of years. As the large companies exist now, are the startups are saying the big companies will only disappear if we’re hit by a meteor? Companies became large by filling a need. While many might not be as nimble, their experience, especially in enterprise software, means they often see the needs of the business community while the small companies are focused too much on their “cool” technology. This week’s Oracle webinar, hosted by the DBTA, was a good example of that. The speakers were Rich Clayton, VP Business Analytics Product Group, and Omri Traub, VP Software Development, and the subject was, no surprise, Oracle Big Data Cloud Service (OBDC. Yeah, I know. Too close to ODBC…). Before we get into the details, people need to be aware that Oracle is fully committed to the cloud, as pointed out in a recent advertorial in Forbes. Oracle is clearly competing with Amazon for enterprise cloud business. Big data is only one part of that. Rich Clayton began the presentation by pointing towards Thomas Edison’s laboratory as an example of using the ideas from many people to not only invent things but also to figure out how to market those inventions. He brought that directly into the evolution of corporate data labs. The biggest problem, Rich stated, is that that labs are usually only populated by very technical people while they require a broader array of talents. 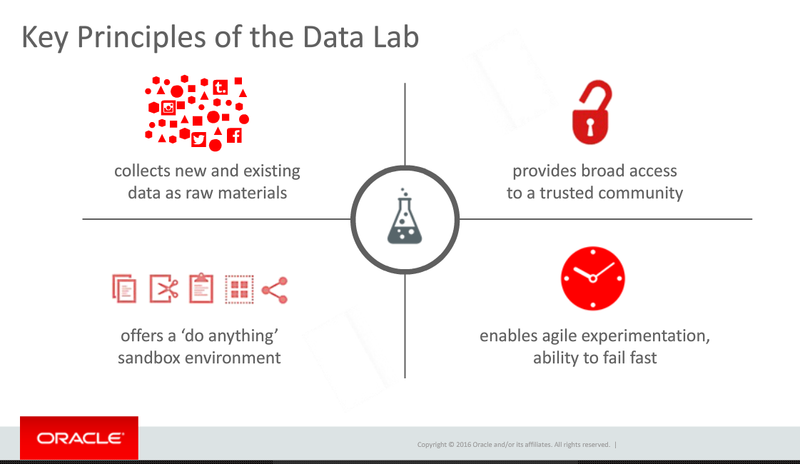 That requirement is one of the data labs principles he defined and one I’ve also described as the missing component of many corporate data labs. A related problem is that most products are so complex and silo’d that very technical people are needed. At this stage in business intelligence and big data, that’s the horse that needs to be addressed before the broad access cart can move. Omri Traub then took over for the demonstration portion of the presentation. Unfortunately, he unintentionally proved the point about technical folks missing business needs by the setup he used for the demonstration. The demo was built around an enormous amount of information on New York City taxi information. While manipulating a billion record data set is cool and powerful, he never presented a business message. He pointed to the large volume of data, talked about other data sources he combined, and then played with the data to show correlations. The problem? Omri, claimed we were gaining insight. Correlations aren’t insight. Understanding how those correlations might impact your business and ideas how to adapt business to meet what you find is insight. Nothing in the demonstration pointed towards insight. Fortunately, Rich Clayton earlier had given a couple of case studies showing business insight gained by OBDC early customers. It would have been much better if Mr. Traub had focused on one of those cases or something similar. The best point of the demonstration was when Omri showed how, in the middle of playing with some relationships, he easily incorporated some analysis created by a different person. As mentioned above, collaboration is critical and it looks like Oracle hasn’t limited that to just a marketing message but has worked to make sure that Oracle’s product helps the team. As many companies claim to do that and it was only an overview, your mileage might vary. Make sure when you talk to them to follow through and see whether the collaboration (not to mention the entire product…) meets your needs. The final section was the Q&A. I’m a marketing person, so I have to be honest and state that it sounded like canned questions they wanted to address, as there was way too much about the full Oracle ecosystem brought into discussion at this point compared to what I’d expect from customers. Still, there was one important point. A question was asked about what advanced analytics might be added. Mr. Taub had the perfect response. After quickly mentioning that, yes, Oracle was always looking at advanced analytics and how to add them, he made a much more important point. Collobaration is key and OBDC is designed to get business people involved. All analytics need to be added in a usable manner, in a way that is understandable and can be leveraged by more people than just the technical resources. That is the critical viewpoint that a large, enterprise focused company can bring to BI, the cloud and big data. That’s why it’s foolish to write off the large companies, the ones with expertise in not just technology, but in business and business relationships. They might not move as fast, but they can move to the right places with the right products and the right business messages. This entry was posted in big data, Business Intelligence, Cloud, Enterprise Software and tagged big data, business intelligence, cloud, cloud computing, collaboration, oracle, oracle big data cloud, teich communications on May 13, 2016 by David Teich. Yesterday’s TDWI webinar was focused on data-centric security. The tag team was Fern Halper, Research Director for Advanced Analytics, TDWI, and Jay Irwin, Director of InfoSec, Teradata. It’s always nice when the two halves of a sponsored presentation fit well. For that reason and for the content, this was a nice presentation. Everyone in the industry knows that data breeches happen, and we all talk about the issue. I’ve seen a few articles and lists about the number of successful attacks, but Fern Halper pointed us to a nice graphic from Information is Beautiful. She also pointed to another study that showed that “In 2013, 33% of respondents said their company had a data breach. In 2014 the percentage has increased to 43%.” It’s always a race between black hats and white hats, so it’s important to minimize not only your chance of getting hacked, but also to minimize the importance and usefulness of data gained from successful hacks. Perimeter security: monitoring network access for intrusion detection. Authorization and Access: Password and role based data protections. Encryption: Using cryptography to encode data. Logging and monitoring: Analyzing access patterns. Each part is necessary but insufficient. Authorization is only as strong as people’s passwords. If it’s easy to steal the encryption key, encryption doesn’t matter. A robust security system leverages all the types. One important note: Later in her presentation and throughout Jay Irwin’s section, encryption didn’t exist alone but alongside tokenization. The later is a different security technology, where characters, words, numbers and fields are replaced with other symbols, or tokens, that still look as if they’re real and can still be used in analysis. Mr. Irwin pointed out he prefers “data protection” as a rubric that covers all the techniques of data level security. Along with that clarification, Jay Irwin also described the multiple layers as “Defense in Depth,” a concentric ring of security to ensure there’s no single point of failure. Jay also provided my favorite slide of the presentation. 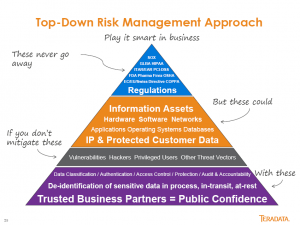 While it’s too wordy, it’s a pretty clear view of Teradata’s top-down approach. An organization must start with understanding the rules and regulations that drive data security. Only then can you identify the data assets that need special attention in order to protect them from hackers. Jay has a lot more to say in a lot more detail, and I won’t cover it all. While I blog about webinars so you don’t have to watch, this one’s an exception. If you want to get a good, broad view of core data security issues, take some time and listen to the webinar. This entry was posted in big data, Business Intelligence, Enterprise Software and tagged big data, data security, enterprise security, information security, risk management, tdwi, teich communications, teradata on January 22, 2016 by David Teich.